Protecting your PDF document with password is one of the best ways to enhance its security. If you have some important or private information in your PDF document that you don’t want others to see then you can secure it using a password. This process is also called PDF encryption or encrypting PDF file with password. To password protect PDF file you need special softwares and tools. These Softwares or tools are known as PDF Locker or PDF Protection tools. These softwares are generally paid and you have to install them to your computer to use them. So how to password protect PDF file for free? Well the answer to this question is by using some of the good online PDF protect tools that can encrypt your PDF file using a password. Some of these PDF tools also allow you to edit or assign permissions to your PDF file. Here in this post I will list down some of the best and reliable online PDF protection tools to secure PDF file with password and also show you on how you can use these PDF protection tools to assign password to your PDF document or file. Here are the best online PDF protection tools to password protect pdf files or documents. These PDF protect tools are safe and free to use. PDFProtect is one of the best free PDF Password Protect online tools available on the internet. 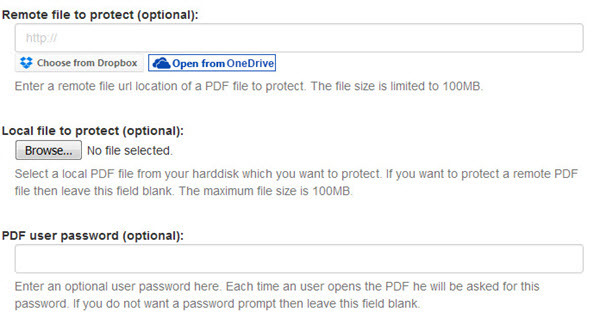 Using this PDF protection tool you can encrypt pdf and assign password to your PDF file. In the advanced options you can change the level of encryption, modify permissions for the encrypted PDF document and can also assign a password to protect PDF document. Step 1: Upload your PDF file from your computer, Dropbox or Google Drive. The maximum upload file size limit is 200MB which is more than enough for most of the users. Step 2: In the Password box, type your desired password to open the PDF file. Step 3: Click on Protect. Step 4: Save the Password Protected or Encrypted PDF file to your computer hard disk. Your PDF file will now be password protected and you need to enter the password (that you have specified in step 2) to view the content of the protected PDF file. PDFProtect respect users privacy and they do not store your PDF files on their servers. The uploaded PDF file gets deleted after the usage. FoxyUtils is the best multipurpose PDF editing and PDF conversion online tool. It is completely free to use and there are no usage restrictions also. It can be used for tasks such as PDF conversion, PDF editing, PDF Protection and PDF Unlocking. FoxyUtils is also known as the swiss army knife for PDF. It has the functionality to lock PDF using password and change permissions of the PDF file. You can also unlock PDF using this PDF tool which is a great plus. The maximum file upload limit is 50MB which I think is enough for most of the users. If you need file size upload limit of 200MB then you have to sign up for a free account. FoxyUtils is very safe and secure to use and your uploaded PDF files will get deleted within an hour of inactivity and it would not be shared to anyone. Smallpdf is another great multipurpose PDF tool for editing, conversion and protection of PDF files. It is not completely free like FoxyUtils as if has usage limit of 2 operations per hour for free users. You can subscribe for its Pro plans for unlimited usage. 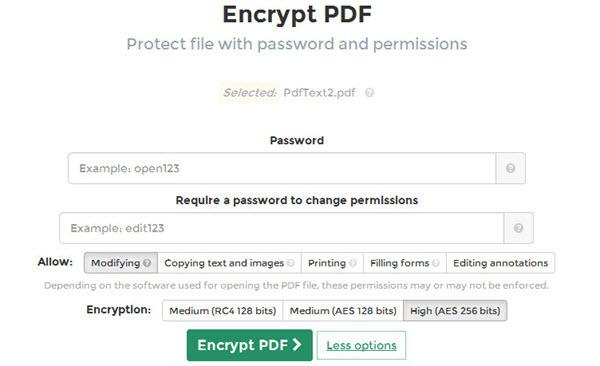 You can use smallpdf to encrypt PDF and password protect the PDF file. This tool uses strong 128-bit AES encryption which makes it almost impossible for anyone to remove the encryption without the correct password. The tool is completely safe to use and the uploaded files gets deleted within one hour. Another good free PDF locker to password protect PDF files and to change PDF permissions. Using this PDF locker tool you can lock PDF files with password, specify the encryption level and change or modify the document permissions. The maximum file size limit is 100MB for PDF upload. A free online PDF protection tool to protect PDF files using password. It also allows you to change PDF file permissions or restrictions such as print PDF, modify PDF contents, copy PDF contents, edit PDF annotations and fill PDF forms. PdfStart is a multipurpose PDF tool that can be used to various PDF tasks. 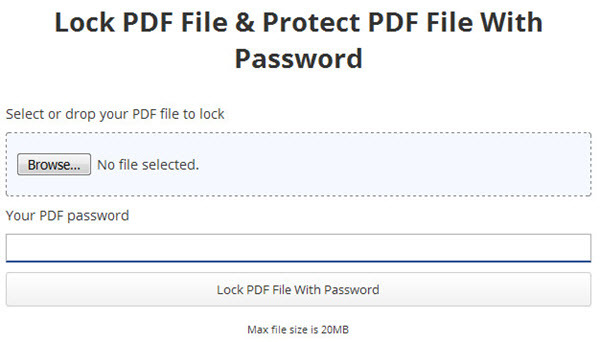 You can use this online PDF tool to lock PDF file and secure PDF with password. It is very simple and easy to use and the maximum file size limit for PDF upload is 20MB. Sedja is a multipurpose online PDF tool that allows PDF conversion, PDF editing and PDF protection. It is not completely free as it has restrictions where you can perform 3 operations per hour and it has also page limit and size restrictions for PDF file. Using Sedja you can password protect pdf files and also modify the permissions with it. It has three levels PDF encryption levels for your convenience. If you want remove password from the PDF file and want it to be seen by others then you can use the online PDF unlocker tools to decrypt PDF file and remove PDF password. These PDF password removal tools are called PDF unlocker or PDF decrypter which removes the protection from the PDF files. PDFUnlock is one of the best online free PDF password remover tool available on the internet. Using this tool you can remove password and restrictions from PDF files. Just upload your password protected PDF file and then enter your password and hit Unlock button. After that password and restrictions will be removed from the PDF file and you can view the content of the PDF file without using a password. All the above mentioned Online PDF Locker tools works fine and as expected. They are also free to use and are safe. If you have any queries or want to suggest another good PDF locker or PDF unlocker online free tool then you can reach us by leaving a comment below.